It’s not unusual for artists and performers to donate creative work. Many first-time authors have been known to offer free e-books in order to create a fan base and gather positive book reviews. It’s also common for musical performers to offer free downloads for fans to gain exposure and build a following. Everett De Morier is an American author whose first novel won the top fiction prize at the London Book Festival in 2015. 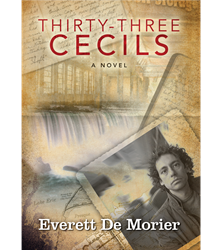 His book Thirty-Three Cecils is now required reading in at least one New York high school and his screenplay is in multimillion-dollar film development. But he has a new theatrical play coming out, and as he has done with the seven other plays before it, he will find a nonprofit theater to give it away to. De Morier wrote six more original plays for Cornerstone Drama of Dover, Delaware. In between, he completed his novel, wrote a screenplay, and created an online magazine. But he always returned to writing for the stage, which De Morier says continues to see dwindling audiences. De Morier goes on to explain that small theaters often produce the plays that they can, rather than the ones they want to. And the plays they can are often the ones that have lower minimum costs per performances, which are well written but have been done and redone for decades. De Morier explains that for a new generation of live theater consumers there is the risk of each performance. Each stage performance could be untested, untried, and therefore not worth the risk of the cost of two movie tickets. Therefore a low cost domain script is safer for a theatre company because it can get that smaller but more faithful audience. De Morier plans on continuing to create new and original scripts and make them available for nonprofit theaters for free, if for no other reason than to give these organizations another option to perform. Everett De Morier is currently completing his latest play, Binghamton Lydia, which he will donate to community theaters this summer.